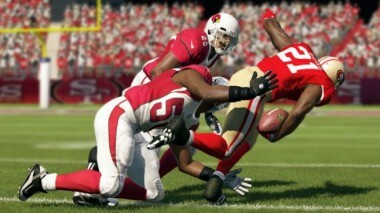 How could Electronic Arts make Madden 13 different from all the rest? First, it’s got pretty good marketing. In a series of YouTube videos, Paul Rudd, perhaps better known as the brother-in-law from “Knocked Up,” and Ray Lewis, the 240-pound linebacker for the Baltimore Ravens, pretend to be best friends and poke fun at each other while playing Madden on the largest TV I’ve ever seen. In one clip, Rudd recounts how he taught Lewis his end-zone dance, a.k.a “The Squirrel,” and, in another, Rudd dances to Wiz Khalifa’s “Black and Yellow” in Lewis’s face, honoring the Ravens’ big rival, the Steelers. Burn. But second, this year’s model is different because it uses all-new technology that makes tackles look even more realistic. EA released the sequel at midnight last night, with thousands of fans reportedly waiting in line to get their hands on a copy. No word yet on how many copies were preordered, but the latest edition is bringing it to a whole new level — which isn’t that easy to do. Madden has always gotten high marks for its ability to replicate the NFL and is even known for influencing game play on the field. In a video with one of EA’s game producers, the company breaks down how it used a new animation engine, called the Infinity Engine, to reflect real-life physics. Based on footage, tackles look like they hurt more when players weigh more; legs and arms also get tangled when contact is made, rather than just passing through the animations. But you can’t please everyone. In a one-star Amazon review, the graphics are commended, but the reviewer argues that the game is a step backward for other reasons, including interface and control changes. Either way, the game will set you back $60, so you’ll have to decide if the graphics update is worth it.